14 week Fundamental Art Skills courses are starting in May. Due to a high demand Magic Wool Art and Craft Studio in Kidderminster will be delivering the Fundamental Art Skills Course again . The course will be running once a week, 3 hours a week for 14 weeks. 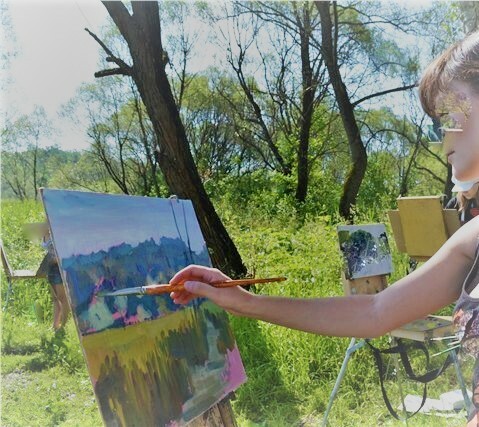 This is a unique opportunity for Art and Craft lovers, beginners and people with some experience in Art and Craft to receive a proper Art education in the traditional methods by a professional artist and a tutor Raya Brown. 6-day course at Bodenham Arboretum. 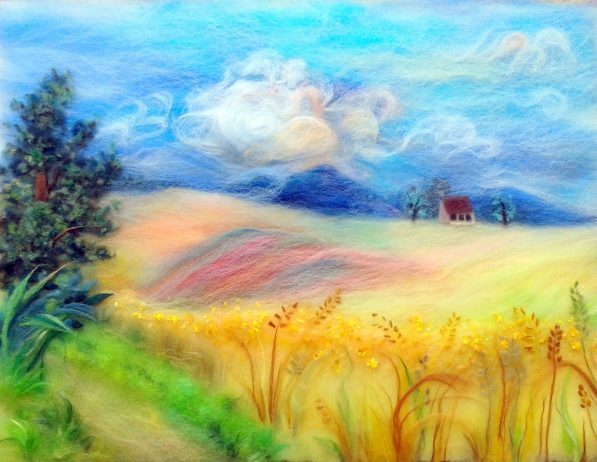 Join us for an inspirational journey, creating pencil and watercolour landscapes, culminating in a unique wool fibre art painting. 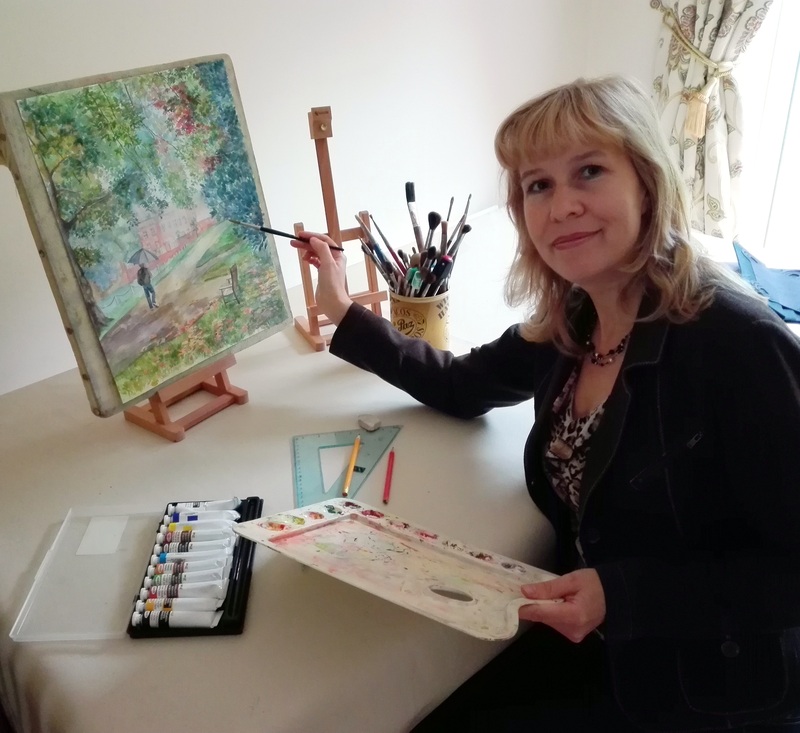 You will be working outdoors in the lovely grounds of Bodenham Arboretum, guided by Raya Brown, a professional Artist and Art Tutor. To begin, you will explore the flora of the great garden by making sketchbook studies of nature - trees, plants, sky, water and the surrounding countryside. You will receive guidance in pencil and watercolour techniques. 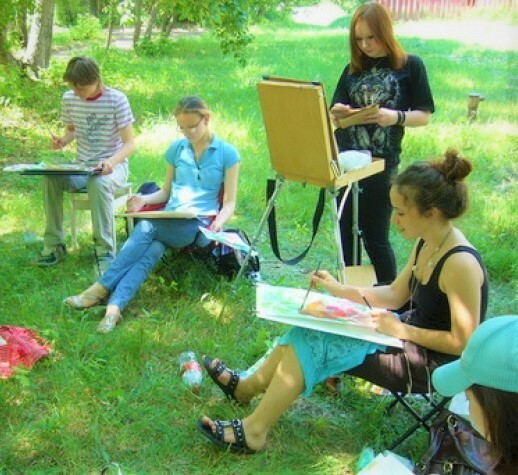 You will explore line, tone, colour and composition as well as develop your observational skills. These studies will help you to capture interesting scenes and convey impressions of atmosphere. 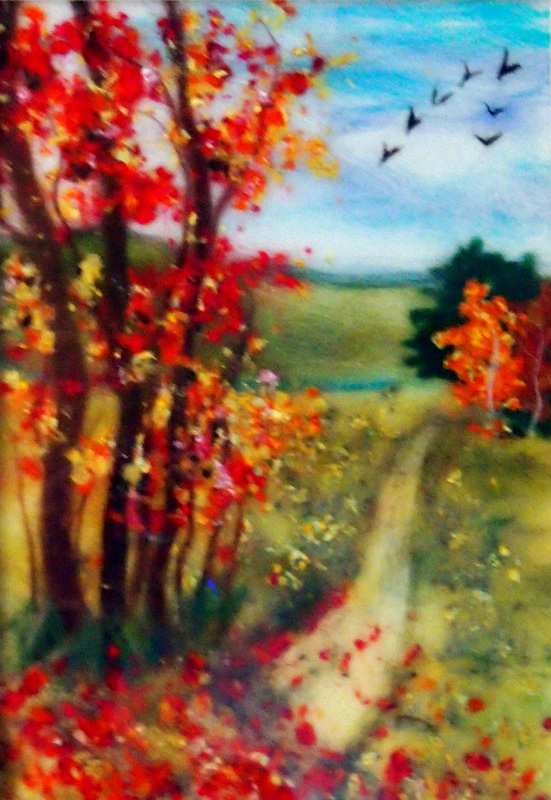 Finally, you will use your landscape work to produce a wool painting/ wool watercolour. Raya will introduce you to the unique technique of making a painting using layers of merino wool and enhancing it with silk and viscose fibres. You will love the therapeutic experience of working with feather like strands of natural fibres and exploring various textures and effects. 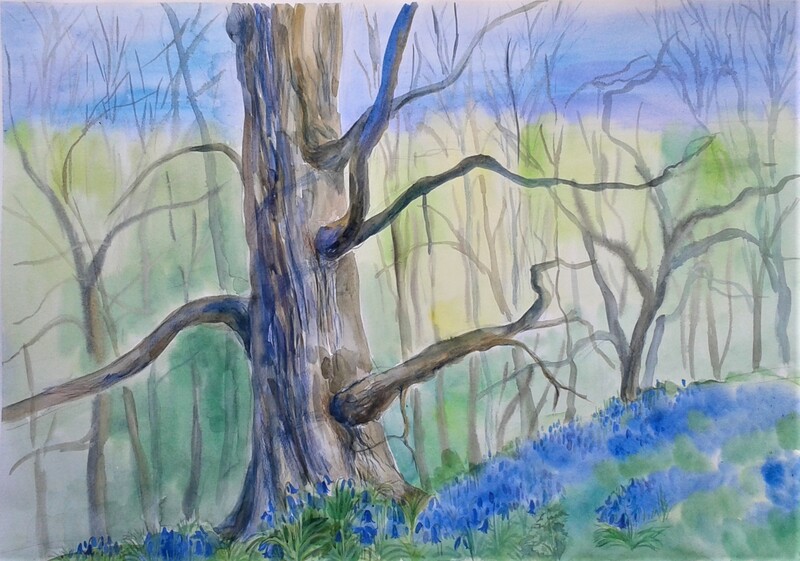 This course is ideal if you are either new to sketching and watercolour or if you have some experience and wish to refine your existing skills. 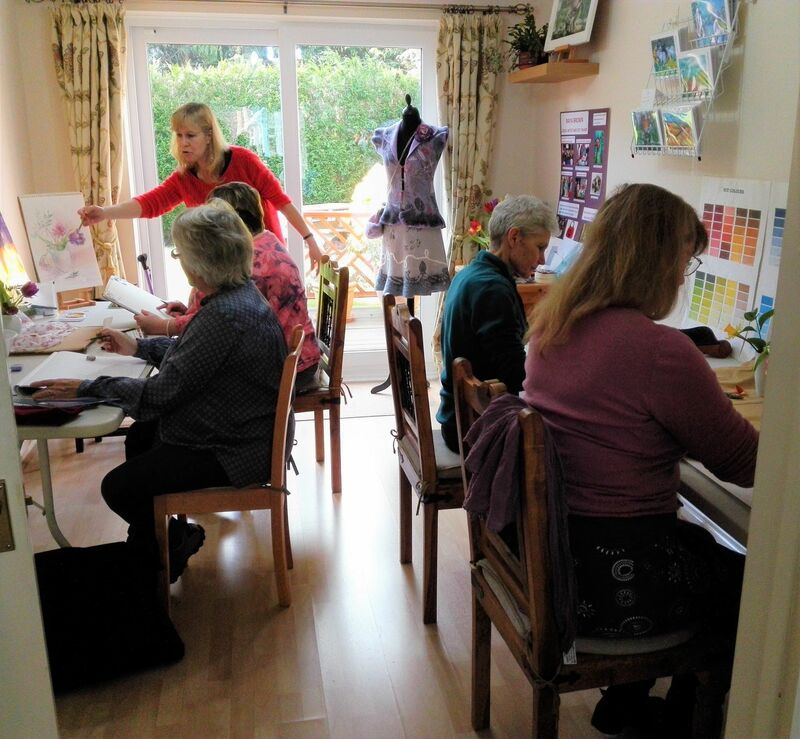 It also offers you the opportunity to learn a new medium, develop your creative skills and share ideas with likeminded people in a friendly, comfortable and tranquil environment. The price of this 6-day course (during a two week period) is £215. 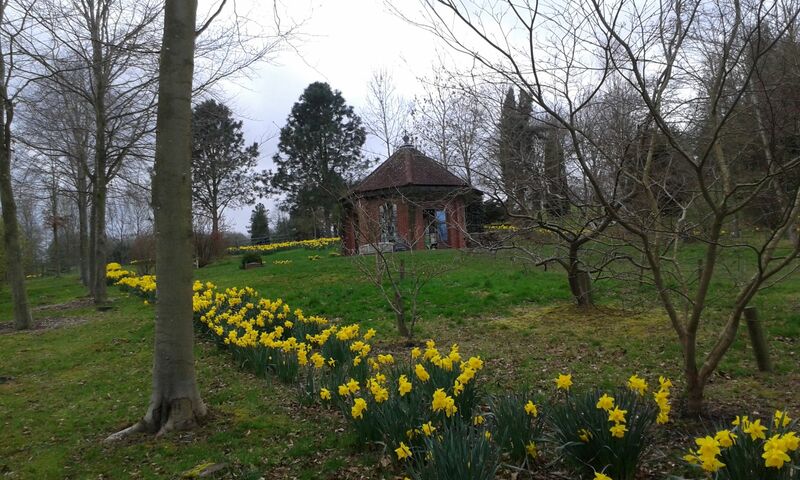 It includes entry tickets to the Bodenham Arboretum, tuition and the cost of some materials. In case of bad weather we will be able to study indoors at the Gazebo on the grounds of the Arboretum. Drinks and a homemade lunch can be purchased from the Arboretum Cafe. The list of materials will be sent to you once you have booked the course. 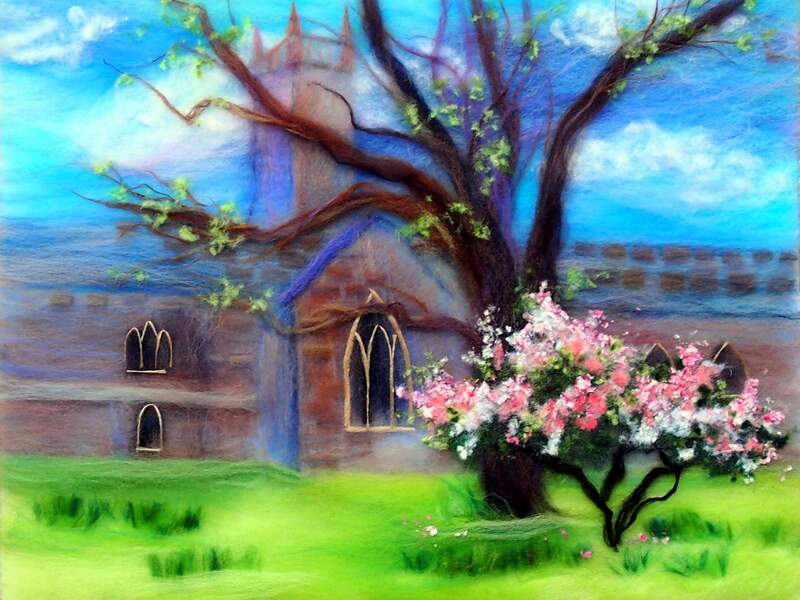 There will be an add-on opportunity to further develop your skills in wool painting. 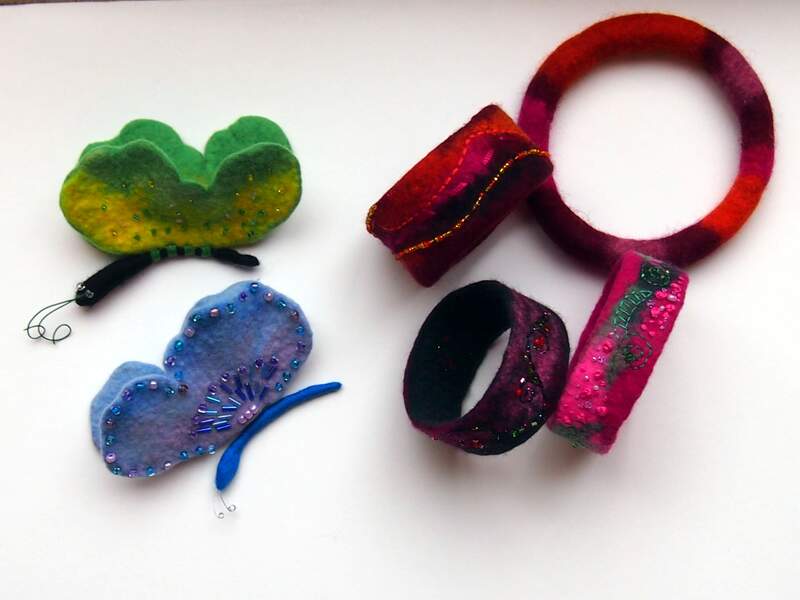 Join Raya at her Magic Wool Art and Craft Studio in Kidderminster on Saturday 14th September and Sunday 15th of September. An additional cost will apply. 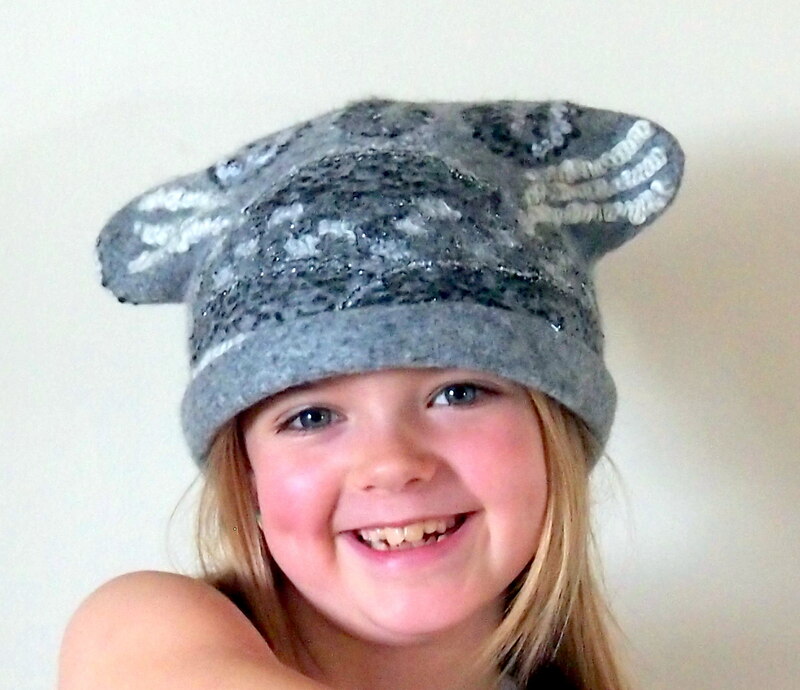 Design and make a beautiful hat for yourself or your child. 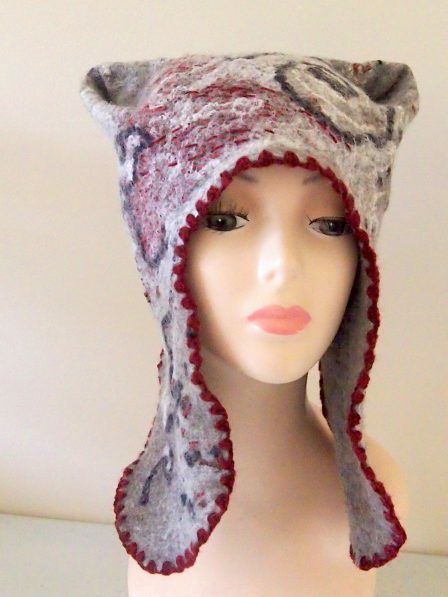 Why not give someone a great present –an animal hat ? 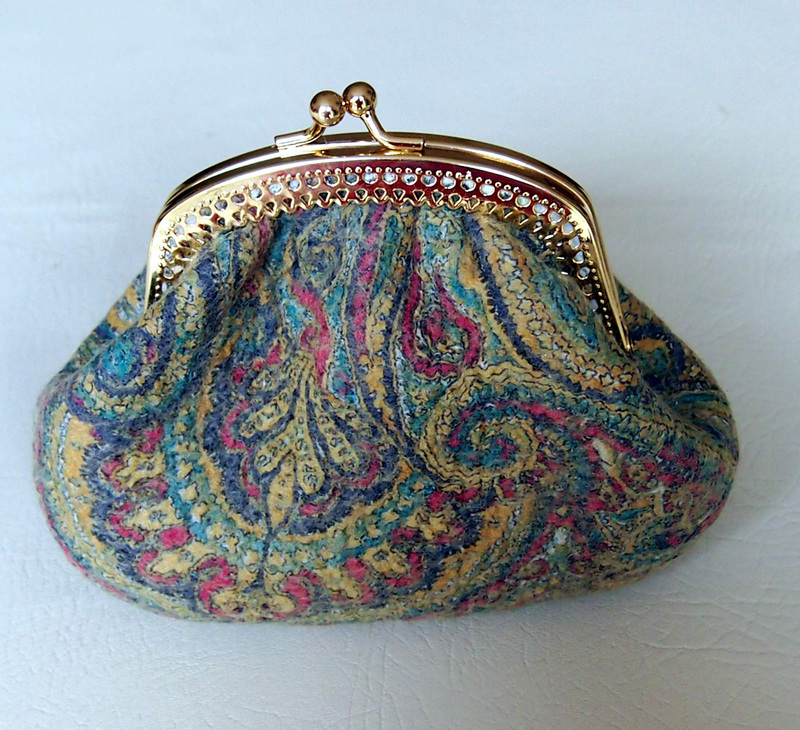 In this workshop you will learn how to make a pattern, use a resist, add a brim, make strings and flaps. Find out how to give your hat a desired shape. You will also be taught how to add various textures and patterns to your work using different fibres and yarns. All in one workshop! Create this stunning accessory which is both sumptuous and easy to wear. 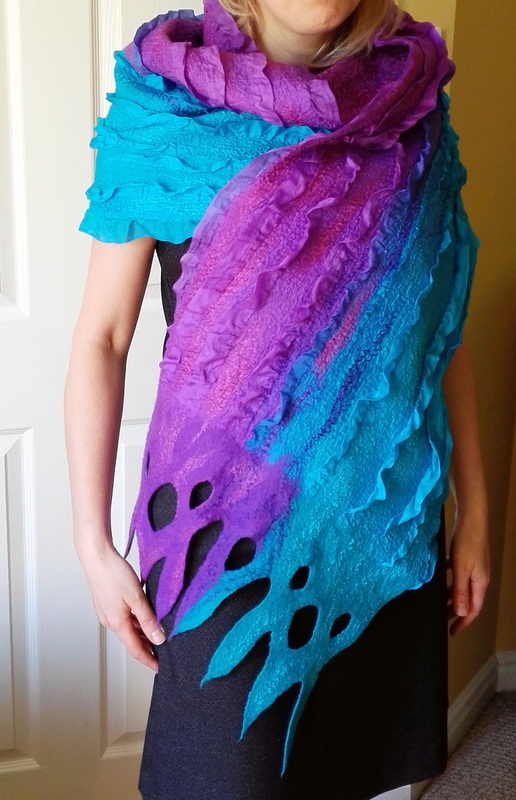 Learn how to make fine felt combining silk fabric and merino wool. Discover how to create beautiful textures and effects using various fibres and yarns. 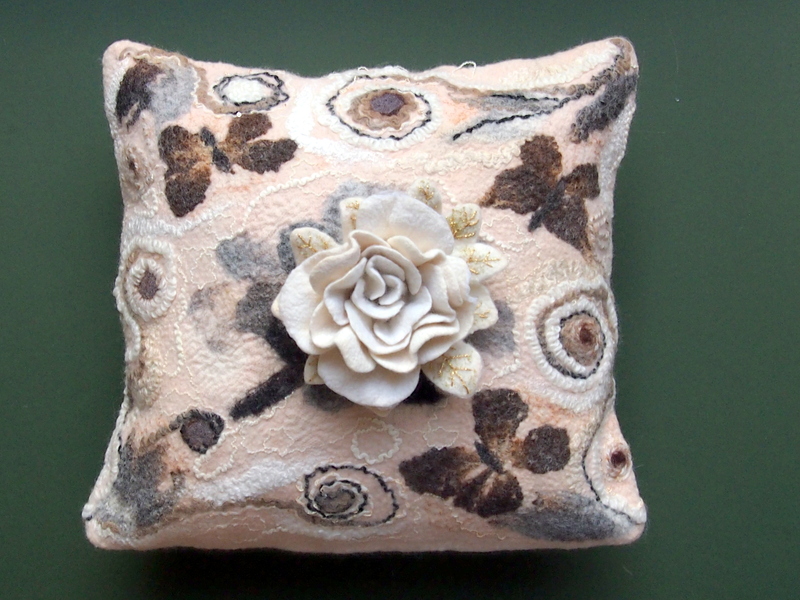 This is a great opportunity to master the Nuno felting technique. This is a very easy and enjoyable workshop for absolute beginners. 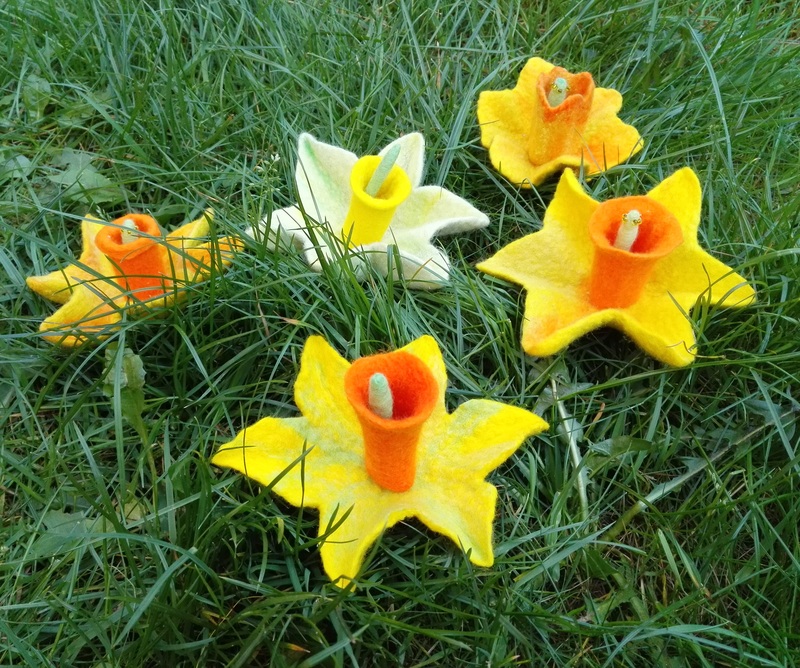 Make beautiful felted flowers –a poppy and a daffodil at this enjoyable and relaxing workshop taught by a professional artist Raya Brown. 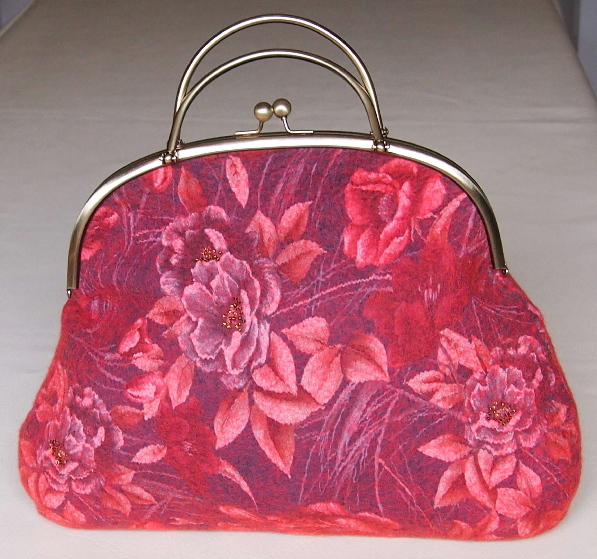 The flowers can be worn as a brooch or attached to a handbag or a hat. 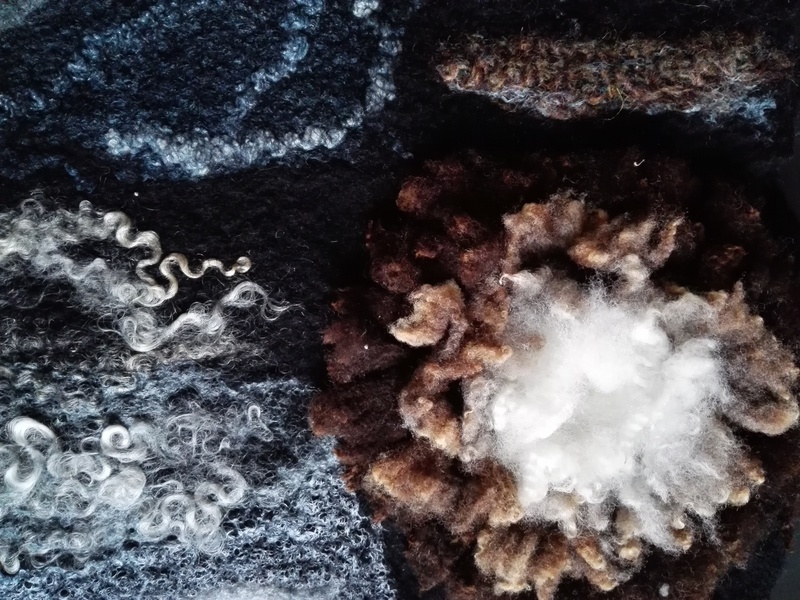 During the workshop you will explore felt making processes and learn wet felting technique. 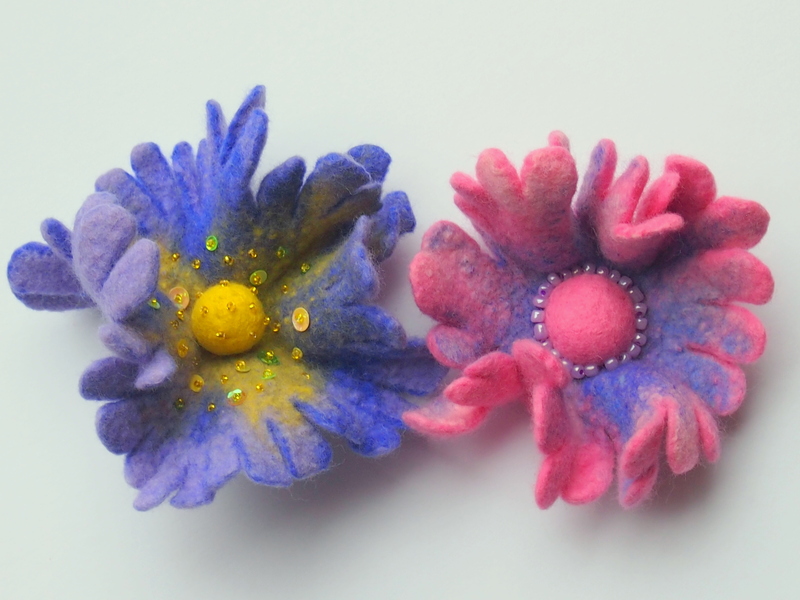 You will find out how to make even felt and create a 3D felt piece. 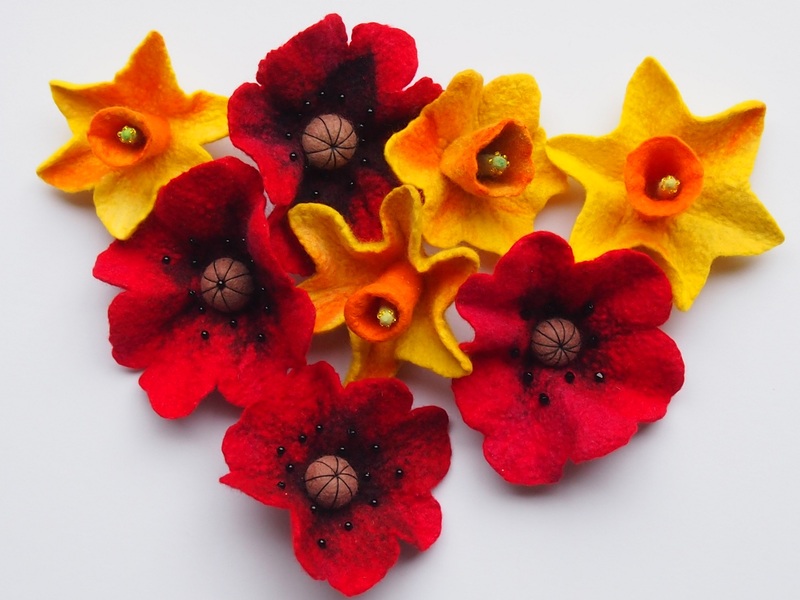 You will take home 2 beautiful hand felted flowers decorated with various fibres and beads. Design and make a beautiful Mobile phone case. 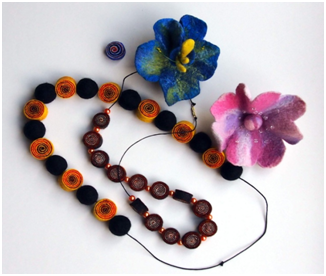 In this workshop you will have a chance to explore different qualities of felt and other fibres and experiment with textures and colours. 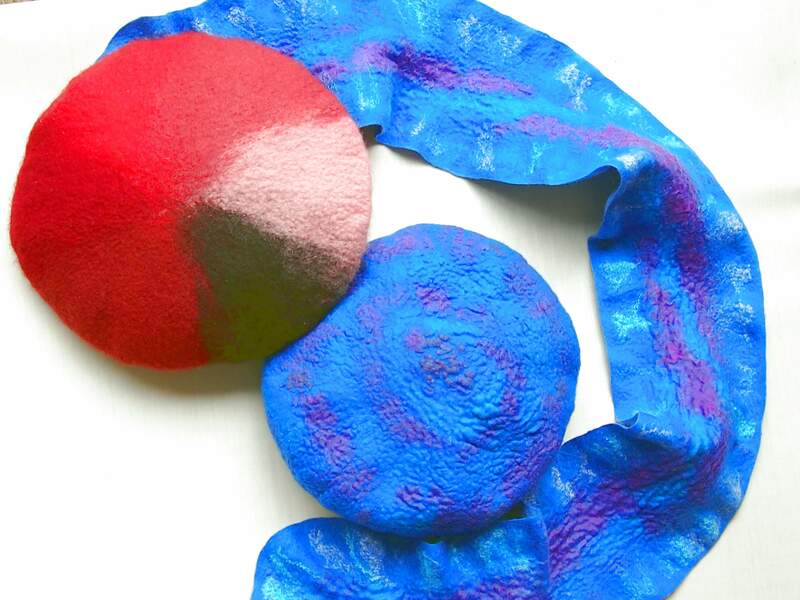 Learn how to make a pattern and use it to create a 3D felt piece. You will also be taught how to use felting needles. At the end of this workshop you will have a great gift, a Mobile phone case, for you or your friend which you can take with you. Saturday 4th July 10am-4pm £75 (materials and delicious homemade lunch from the Gallery's cafe are included). The course will take place at the beautiful Bevere Gallery in Worcester. 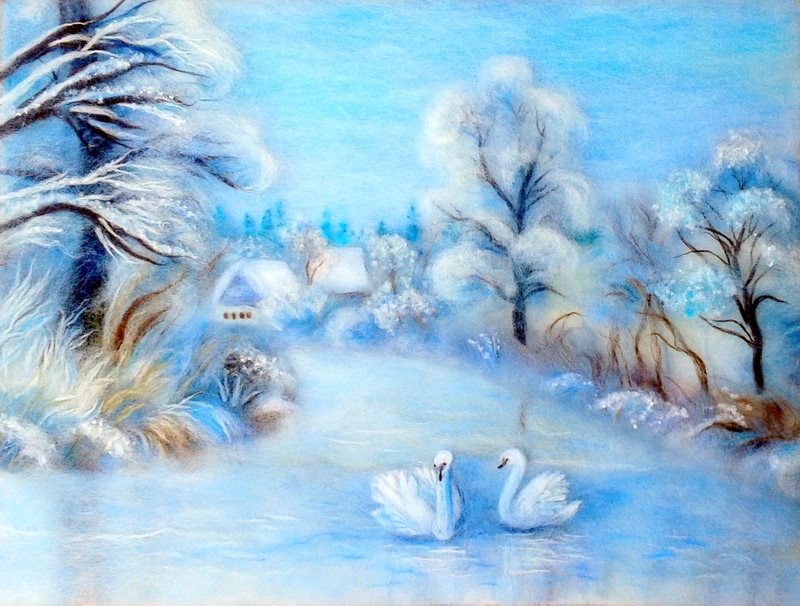 Wool painting or wool watercolour, as some people call it, is a unique relatively new technique which originated in St. Petersburg. This is not felt making. It is about creating a fibre picture using merino wool, silk and viscose. 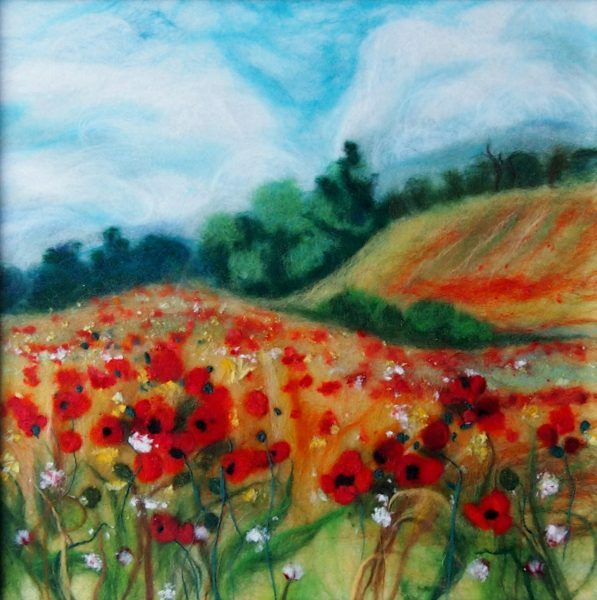 Laying and shaping fibres, blending the colours together, creating beautiful textures and effects with a professional Artist Raya Brown is a great experience for complete beginners as well as people with some knowledge of Art and Craft. Following Raya’s step by step instructions you will create an amazing picture with some lovely watercolour effects and textures, which you will take home at the end of the workshop. Come around and enjoy tactile therapeutic experience of working with beautiful feather like strands of natural fibres in a relaxed and friendly atmosphere. 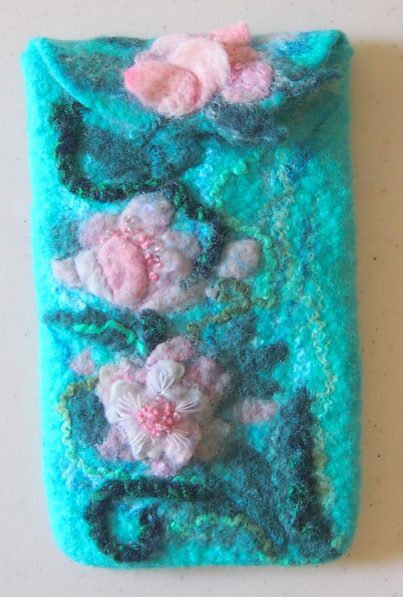 In this workshop you will make a fantastic felted scarf. Felted scarves are light weight, yet surprisingly warm and snug. You will learn how to lay out wool fibres to create wearable and even felt. You will explore various decorative fibres, silks and threads and use them to decorate your scarf. I will also teach you to make an even edge. 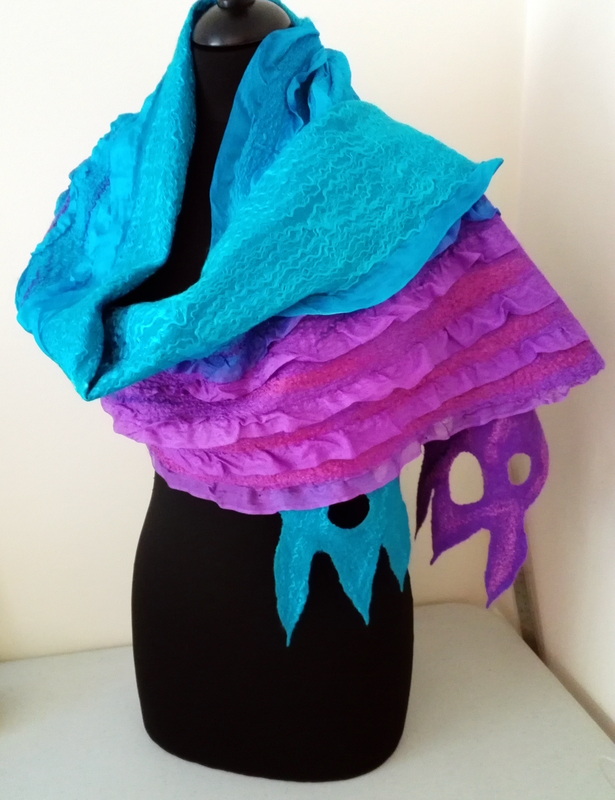 At the end of this 6 hour workshop you will take home a sumptuous scarf or a wrap. sumptuous scarf or a wrap. This is a great opportunity to explore the unique qualities of various British Fleeces. Learn and further improve your wet felting techniques. You will have a chance to experiment with Shetland, Gotland, Ryeland, Manx Loughton and Wensleydale wools. Learn what textures and colour effects could be made. Find out how you can use different wools for the best results. During the workshop you will create some test pieces as well as a small wall hanging or a table mat. 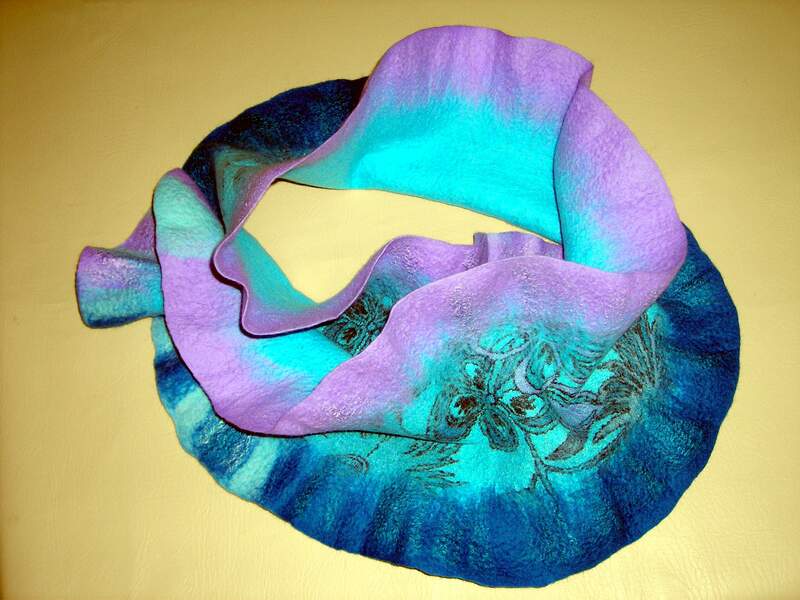 During this workshop you will make a fantastic scarf with frills in Nuno Felting technique. You will learn how to lay out wool fibres to create wearable and even felt. You will explore different decorative fibres, silks and threads and use them to decorate your scarf. I will also teach you how to make a frill and even edge. 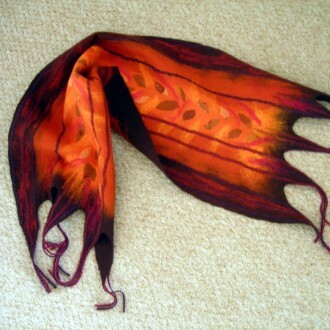 At the end of this 7 hour workshop you will take home a sumptuous scarf or a wrap. This is a very easy and enjoyable workshop for absolute beginners. 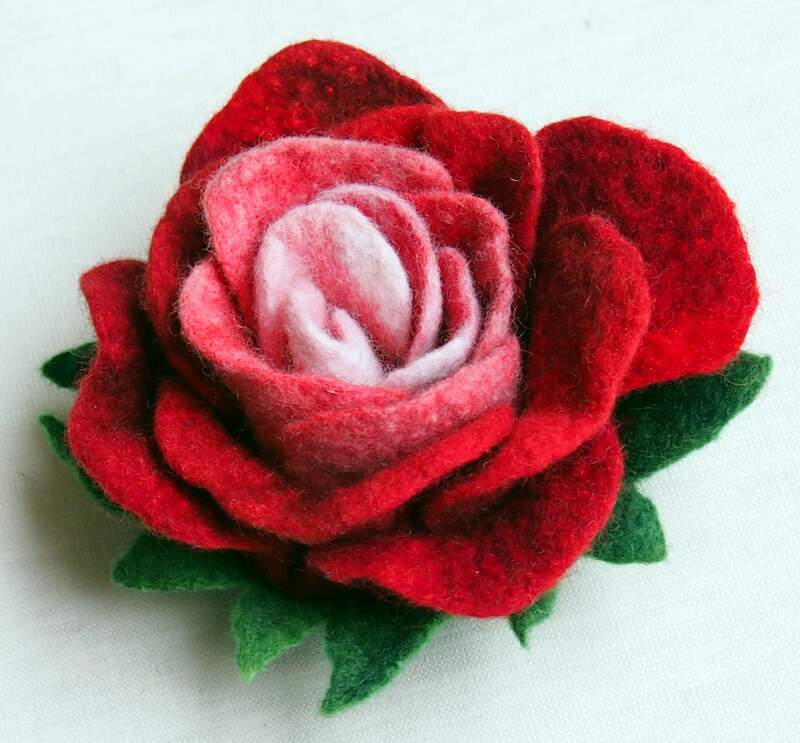 You will make unique hand felted flower that you can wear as a brooch or attach to your bag or hat. During this workshop you will learn how to make basic felt using merino felting wool, explore the wet felting processes and techniques. Following step-by-step instructions by Raya, experienced Felt maker, you will enjoy the tactile therapeutic experience of working with natural fibres. You will also experiment with design, colour and texture. You can add beads and tendrils and leaves to your flower . Have you got a picture or a photograph of your favourite landscape? I am sure you have. Please, bring it to the Magic Wool Studio where you will be able to recreate it in wool fibres using the unique technique of wool painting. Wool painting or wool watercolour, as some people call it, is a unique relatively new technique which originated in St. Petersburg. This is not felt making. It is about creating a fibre picture using merino wool, silk and viscose. 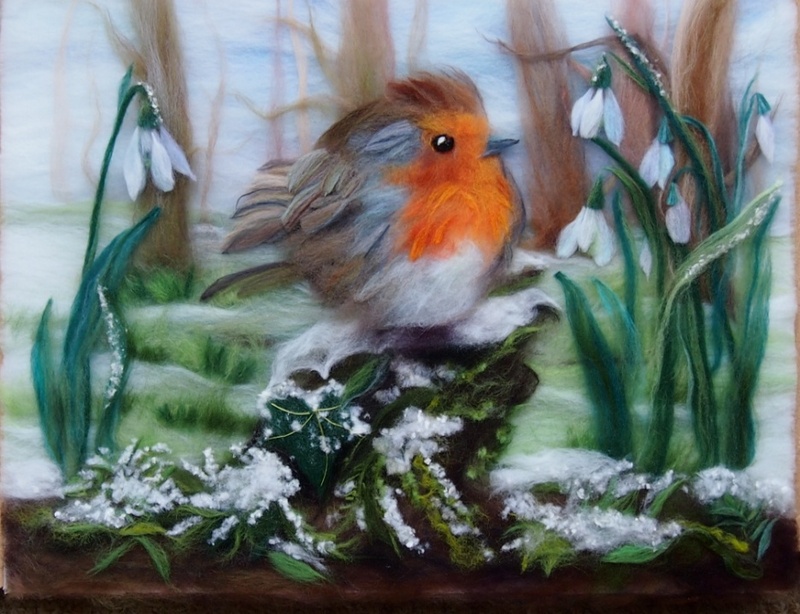 Laying and shaping fibres, blending the colours together, creating beautiful textures and effects with a professional Artist Raya Brown is a great experience for complete beginners as well as people with some knowledge of Art and Craft. Bring a picture or a photo that you would like to recreate in fibres. Following Raya’s step by step instructions you will make an amazing picture with some lovely watercolour effects and textures, which you will take home at the end of the workshop. Come around and enjoy tactile therapeutic experience of working with beautiful feather like strands of natural fibres in a relaxed and friendly atmosphere.